Climate is seen as one of the most important resources of a tourist destination and recently there has been increasing interest in the impacts of climate change on tourism. 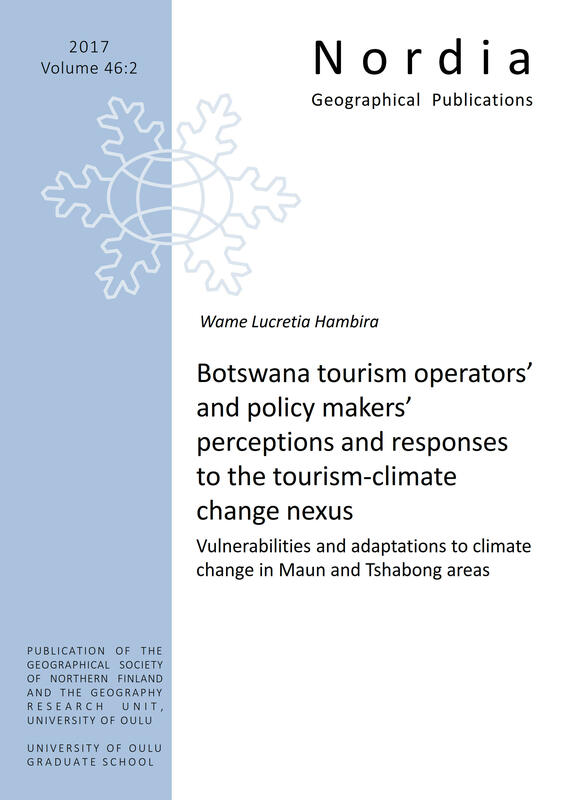 This study analyses the possible impacts of climate change on Botswana’s tourism industry as perceived by operators and policy makers with a view to identifying adaptation needs. Two ecologically distinct areas of Tshabong (Kgalagadi desert) and Maun (Okavango Delta wetlands) in Botswana were targeted as case studies. The results indicate that the tourism operators in both areas are not proactive in institutionalising adaptations against the potential impacts of climate change because they saw the consequences affecting their operations only in the future while policy makers decried limited information and uncertainty as constraints to appropriate responses to climate change. The study concludes that appropriate adaptation strategies need to be devised despite uncertainties and inadequate knowledge on the subject.